Carolina Signs provides all types of Business Signs, Sign Installation & Hanging, Commercial LED Retrofits, Sign Lighting, Parking Lot Lighting, Commercial Lighting Services, and Vehicle Graphics & Lettering. Lighting up North and South Carolina. Lighting is essential to a business’s operation. Whether it’s the business’ sign light, parking lot lightings, outdoor commercial lighting, or office interior lighting we provide the quality service and product you want. Retrofit your commercial lighting to LED lighting to save money, save energy and to be environmental friendly. Ask us about the different Energy Saving LED Light Upgrade Rebates and Incentives that may be available for your business. Duke Energy, other Power Companies, plus State and Federal Government offer these energy savings programs. 10 Year Warranty on all LED Lighting Installs and Retrofits! Outdoor sign installation and hanging job for DiVita in Charlotte NC by Carolina Signs. Carolina Signs specializes in all types of signs for North Carolina, and South Carolina businesses. Get more exposure and attract people with permanent or temporary signs. Call us today for a quote! 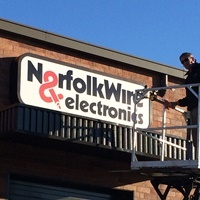 Carolina Signs offers Sign Maintenance, Repairs, and Sign Lighting Replacement. 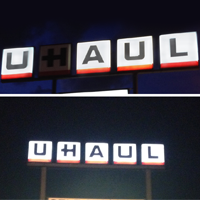 LED retrofits give a new look to an old sign. Get energy efficient LED Light Retrofits and save up to 80% on your light bill. Before potential customers see you, they see your sign. 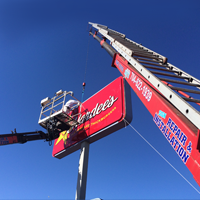 Carolina Signs offers Sign Installation and Hanging services up to 75’ high. Whether your are a national chain or a local business call us today! Parking Lot & Street Light replacement and repairs. 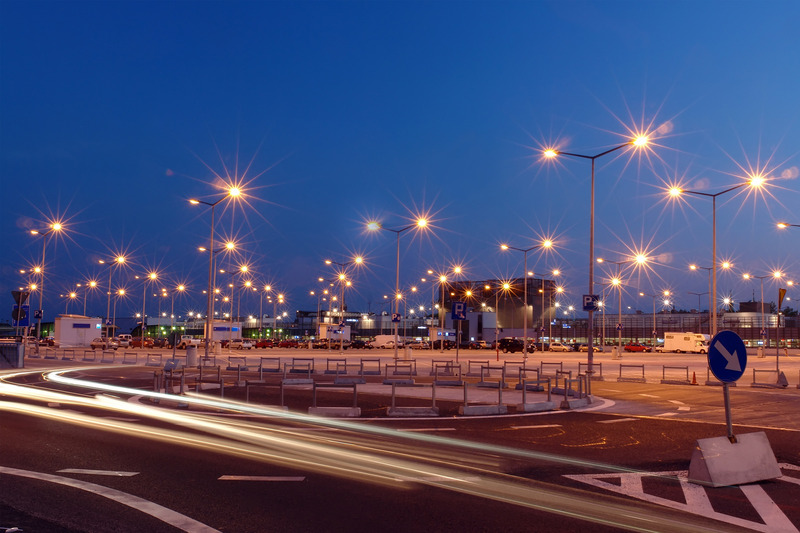 Get brighter lighting while saving energy and money by retrofitting to LED Lighting. 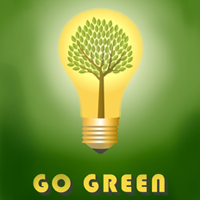 LED Lighting uses 80% less energy than incandescent bulbs. Go Green! Upgrade commercial incandescent and florescent lighting to LED Lights. Save Energy! Save Money! Convert Sign lighting, Parking Lot lighting, and Commercial Lighting. Serving North Carolina, and South Carolina. 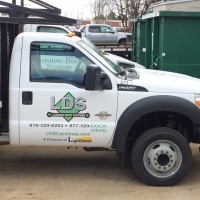 Transform your company cars, vans, and trucks into moving billboards seen by millions of people in the Charlotte, NC area each year by applying your company’s graphics and logo to the exterior. LED Lighting uses 80% less energy than incandescent ballast light bulbs and 40% less energy than florescent tube lighting. For all your commercial lighting needs in North Carolina, and South Carolina, contact Carolina Signs today. SAVE 80% on your lighting bill with energy efficient LED Sign & Parking Lot Lighting that are brighter and use less energy. SAVE on light bulb replacements. Traditional light bulbs have to be replaced every 2-4 years. 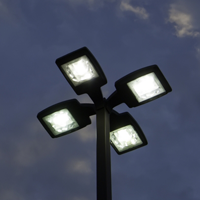 Get a 10 Year Warranty on all LED Lighting for your signs and parking lot lighting. Serving North Carolina and South Carolina. Focusing in Charlotte NC, Gastonia, Concord, Lake Norman, Winston Salem, Greensboro, Hickory, Boone, Asheville NC, Greenville, Spartanburg SC, and other surrounding areas. Serving North Carolian and South Carolina. Focusing in Charlotte NC, Gastonia, Concord, Lake Norman, Winston Salem, Greensboro, Hickory, Boone, Asheville NC, Greenville, Spartanburg SC.